"Happiness is the richest thing we will ever own." I had hoped to have a disability related post up today but earlier in the week I went out looking for Pokémon for three hours and cleverly decided to forgo sunblock. Living in Northern Ireland we aren't afforded sunshine very often and this means every year I forget what it's capable of and every year I get at least one bad burn. Well, this year I topped all previous years. Not only have I spent the last couple of days in a lot of pain but my arms and hands swelled up. I'm also in the pre-period stage where I feel lethargic, frustrated and have cramps, preparing for the blood beast to arrive. All in all it hasn't been a great few days BUT I did catch an abundance of Pokémon on the outing so it wasn't totally in vain. Anyway, as I find it difficult to concentrate at the best of times I decided to go with an easier blog post for today. I already had these photos taken and had planned this post for a while anyway. 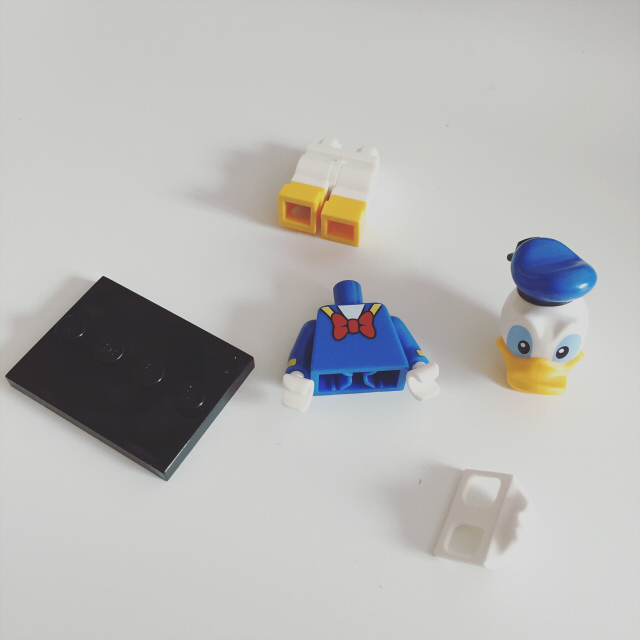 Today I'm going to show you some Disney Lego Minifigures Blind Bag toys I got a while back. I'd been anticipating these blind bags for ages and was excited when I finally picked some up. So on to what I got. What I love about these particular Lego blind bags is the unique sculpts. Their body's stay true to what we know and love about Lego figures but I love that rather than relying on the paint job to capture the character they have sculpted them. I especially love Donald's little tail piece. The rest of his body is the regular hard plastic but his tail is sort of rubbery. Donald doesn't have a lot of paint work on him but what he does have is done very well. I was more than happy with the quality. Hook is one of my favourites out of the ones I got. I love his expression and I also love his hair sculpt. Those of you that have read previous toy posts of mine know that I'm a sucker for a good hair sculpt. 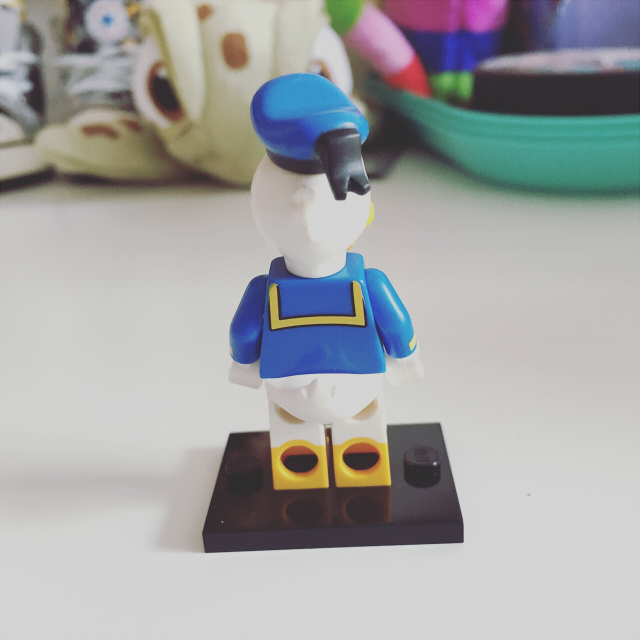 He has a little more paint work on him and it's just as flawless as Donald's. Unlike Donald, Hook has an accessory with him. He has his sword to hold, which really finishes off the figure well. This little dude is another of my favourites. I just love the sculpt. Once again it stays true to Lego but then they've given him this unique head sculpt. Unlike others his legs can't move. and he also has the least amount of parts as he doesn't come with an item or anything. One of my favourite things about him is the little planet detail on his chest. Such a small detail but very well done. Out of all the ones I got Maleficent's design is probably the most intricate and she has the most pieces. Her little headpiece is made out of the same rubber as Donald's tail and her cape is made out of fabric. I think she just looks awesome and I was really glad I got her. I was really happy I got Daisy to go along with Donald. As far as I remember most of the figures have another that corresponds with it. Like the Alien has Buzz and Hook has Peter Pan etc. I was glad I got at least one pair and I think Donald and Daisy are just adorable together. I particularly love Daisy's big bow. Lastly we have Aladdin. Oh, Aladdin. How you haunt me... but more on that in a moment. I really love Aladdin's expression and once again - you guessed it - I like his hair sculpt. His chest detail is cute too and I also appreciate the little patch on his trousers. As you can see Aladdin also has an item and it's his lamp. As far as I remember the corresponding figure with Aladdin is Genie so I'm glad they included the lamp for that reason. Now why he haunts me. This isn't actually my first haul of these blind bags. I'd gotten a few before but it was while I still intended to start my toy blog again but was on hiatus, so I didn't bother photographing them etc. I had also got Aladdin in that little haul, not once but twice! I have a grand total of three Aladdins! Which I wouldn't mind so much only that these are about £2.49 a pop which sure adds up. I feel like he's mocking me with that mischievous look and I'm almost nervous to get any more in case I end up with MORE Aladdins. I guess that's all part of the fun. If anybody wants to adopt an Aladdin for their collection, let me know. So here you have it. My little Disney Lego Blind Bag haul. I'm hoping in the next day or two my sunburn will feel a lot better and I'll get on with the posts I had planned. 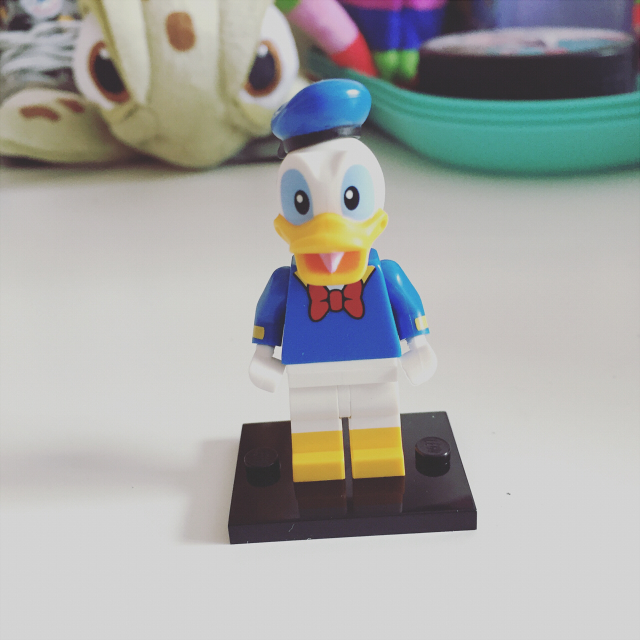 Which Disney character would you like to see in Lego form? I love these little guys. I haven't bought any yet, because I am very picky and particular with Disney merch, but I really like Donald & a few others, so I might bite & grab some soon! As for which characters I'd like to see...Goofy! Goofy's a favourite of mine. Also a little lego Beast would look cool, and maybe Sully from Monsters Inc! Oh no, so sorry about the sunburn! *hugs* I hope it heals soon! Oh mannnn. Pokemon Go is the reason that I have been extremely sunburnt lately. I've probably got more sun these past three weeks than I have in the last three years. Like I said on IG already, I wasn't super huge into disney as a kid (Save for A Goofy Movie and 101 dalmations) but I've been getting back into the classic older Mickey & Crew cartoons from the 70s-90s, and I've been REALLY into how cute the Tsum Tsum collectables are. 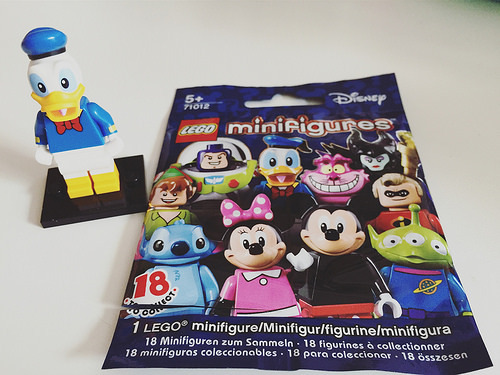 I am pretty impressed with these minifigs, especially the Daisy and Donald ones. Pretty cute! Also god, is there anything more insidious than blind bag toys? I got into the Minecraft ones trying to chase down the Mooshroom. Totally dumped like $40 into them. Never got it. Totally can get them for like $10 on the internet, too. Go figure.